MOSCOW (Reuters) - Russia sold a 16 percent stake in state diamond miner Alrosa (ALRS.MM) at the bottom of a planned price range on Monday, highlighting the lack of progress in a state privatisation drive that was supposed to net $13 billion this year. The $1.3 billion stake in Alrosa (ALRS.MM), which vies with De Beers (AAL.L) for the mantle of the world's largest diamond producer, is the Russian state's only sale this year and one of the ten biggest in Europe so far in 2013. But the low sale price prompted some analysts to suggest it had been a struggle to place all of the shares on offer, adding to the delays or false starts that have hampered the plan to generate $13.44 billion from sell offs this year. Alrosa's offer price of 35 roubles per share, putting the company's market capitalisation at 258 billion roubles ($8.12 billion), was at the bottom of the projected range of 35 roubles and 38 roubles a share. "At least they got something, but not that much, and it was way below what they had originally planned," said Uralsib economist Alexei Devyatov. "There is no clear political will in the government to do the privatisation ... They don't fulfil their own plans." Prime Minister Dmitry Medvedev in 2010 laid out a programme of sales aimed at drawing more investment and energy into the state sector and revitalising the weaker areas of a $2.1 trillion economy now growing at its slowest pace in four years. But, as many analysts predicted at the time, government has since proceeded to slash the privatisation targets, unable to reach a consensus on deadlines for sales and hampered by officials who argue a weak global economy makes this the wrong time to sell some of the prize assets on offer. Sales of shipping group Sovcomflot, a stake in oil monopoly Rosneft (ROSN.MM) and Russian Railways had all been on the cards for this year, according to plans from last October. A year on, only Alrosa has been completed. Russia's First Deputy Prime Minister Igor Shuvalov said on Monday the pricing of the Alrosa sale showed a robust level of investor interest. "There was a proposal to set a lower price limit of about 33 roubles. We took a risk and set the price at 35 roubles ... both the oversubscription and the quality of investors show that the decision was correct," Shuvalov said, speaking at a ceremony to launch the sale at the Moscow Stock Exchange. Two sources close to the deal told Reuters the order book was oversubscribed by 30-40 percent, while other market sources said U.S. investors were the biggest buyers of the shares, purchasing up to 60 percent of the stake. Russian investors accounted for around 14 percent. Buyers included U.S. asset management group Lazard (LAZ.N) and investment firms Capital, Highbridge, OppenheimerFunds and PIMCO, as well as a state-backed fund, the Russian Direct Investment Fund (RDIF), whose mandate is to co-invest with private partners. Traders can start dealing in the shares late on Thursday. Others were less bullish on how the sale had gone. Sergey Donskoy, metals and mining analyst at Societe Generale said organisers had done well to secure this level of investment. "From what we know it wasn't easy to build the book even at the bottom of the range, it required some effort, but despite all the difficulties the organisers didn't lower the price range or cut the number of shares on offer," he said. "It wasn't exactly a dotcom story, there wasn't crazy oversubscription from the start so the organisers must have felt some tension until the last moment." 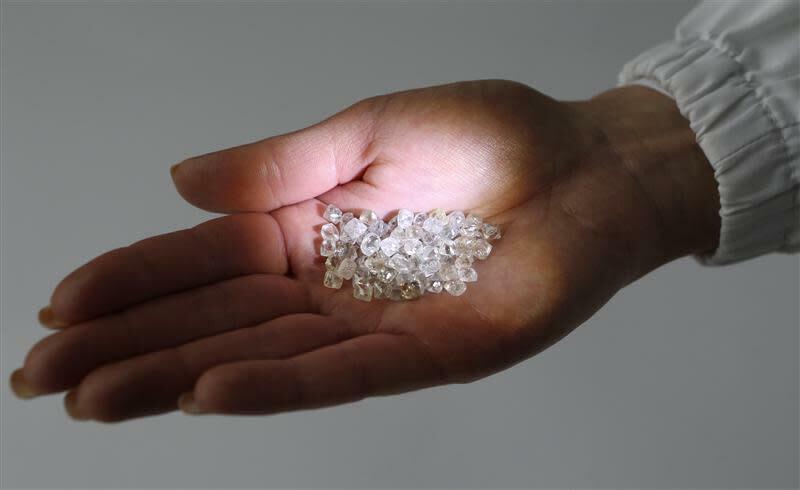 Alrosa, which accounts for 25 percent of global diamond production by value, is listed on the Moscow stock exchange, but only a small number of its shares are available to trade and the market is illiquid. The sale will lift its free float to 23 percent. "This was the first major mining IPO in Russia since the crisis," said Donskoy. "The first large deal in the Russian mining sector in the last five years, so it's an important achievement."